The ongoing U.S. government shutdown has led a woman with local ties to worry about her husband’s travel visa application. Amber Cypcar, a 2011 graduate of West Bend West High School, moved to Ecuador three years ago, but returned to the United States Dec. 12 to visit her family for the holidays. Cypcar’s husband Luis Bailon, a native to Ecuador, was unable to join her, even though he had begun the application process for an American travel visa in June. Due to the current government shutdown, neither Bailon or Cypcar know what is happening with the application. Bailon, who is also a salsa dance instructor, had hoped to attend one of New York’s many salsa programs. He planned to first meet Cypcar’s family in Wisconsin, then study and dance in New York for about a year. 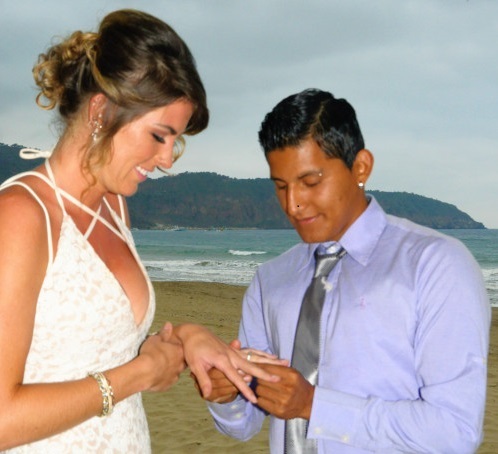 West graduate Amber Cypcar and her husband Luis Bailon exchange rings on the beach in Puerto Lopez after their wedding in November 2017. Though it is not a typical practice in an Ecuadorian civil union wedding, it was important to Cypcar that they exchanged rings. Photo courtesy of Cypcar. The current government shutdown, which is now the longest in U.S. history, began Dec. 22 after Congress did not agree to put $5.7 billion of the government’s 2019 fiscal year funds toward President Trump’s proposed wall along the U.S.-Mexico border. Without funding legislation in place, some departments of the U.S. government have been partially shut down. Cypcar thinks the government has not been clear about whether it is still processing travel visa applications through the shutdown. Bailon shares his wife’s frustration. This is not the first time that Bailon has applied for a U.S. travel visa. According to Cypcar, her husband has previously been denied a visa three times. Each time, Bailon was asked approximately two or three questions during the interview stage before his application was rejected. Bailon said that before his first interview, he had been excited and certain that he would be granted a visa. He says that after his application was denied, he felt confused and did not know what to think. Bailon recalls that after leaving the consulate where the interview took place, he looked around and realized that he was not alone. 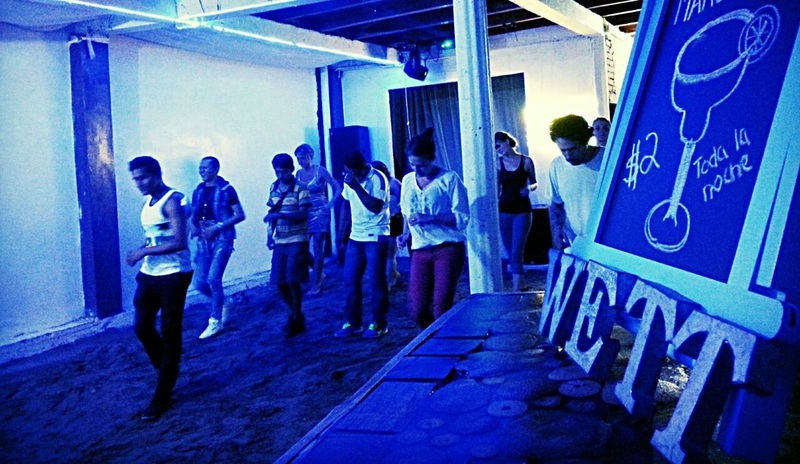 Luis Bailon teaches a free salsa class every Thursday in the discoteca. Bailon hopes to study salsa in New York, but has not yet decided which program to pursue. Photo courtesy of Amber Cypcar. Because he is currently unable to enter the United States, Bailon continues to run Wett, the Puerto Lopez bar that he opened with Cypcar in February 2017. Cypcar says that she must return to Ecuador by April, since they are expanding the bar before the tourist season begins in June. When asked about his passion for salsa, Bailon said that he believes he was born to dance and that it is his way of life. Lorraine Backus, Cypcar’s mother, is disappointed that Bailon was unable to make it to the United States in time for the holidays. Backus, who is the only member of Cypcar’s family to have met Bailon thus far, was looking forward to witnessing his experience of a snowy Wisconsin Christmas. A building in Puerto Lopez, Ecuador. West graduate Amber Cypcar moved to Puerto Lopez two years ago after spending a year teaching English to adults in Quito. Photo courtesy of Cypcar. Bailon had also been excited to spend the holidays with Cypcar’s family, but he is hopeful that he will meet them soon. Cypcar explained that during her time in Ecuador, she befriended a young Syrian woman that had issues with the process of applying for a U.S. travel visa. Cypcar’s friend, after being accepted to Columbia University, applied for a visa while in Ecuador. Cypcar says that her friend was unsure if any of her loved ones in Syria were still alive, but she had to go back and “continue to try.” This experience was before Cypcar had met her husband, so it opened her eyes to the difficulty of obtaining a U.S. travel visa. Cypcar moved to Ecuador soon after earning her bachelor’s degree at the University of Wisconsin-Madison. She taught English to adults in Quito for a year before opening Wett in Puerto Lopez, where she has now been living for the past two years. Besides running her bar with Bailon, Cypcar also works as a real estate agent and office manager for Live the Life. 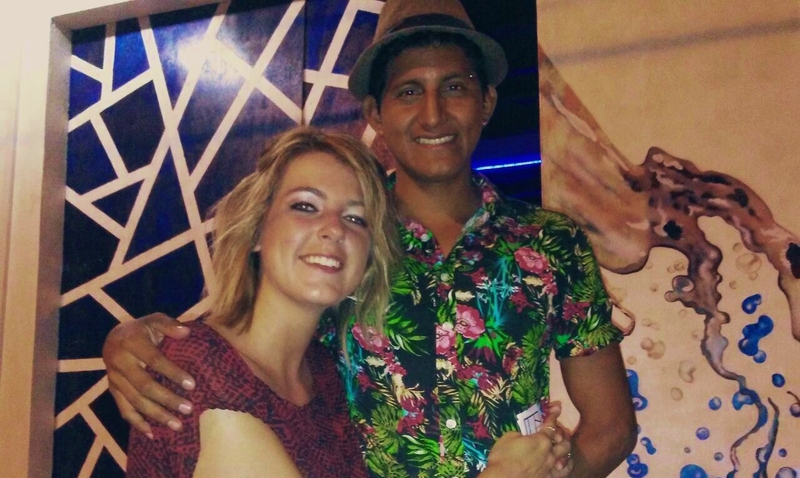 Cypcar and Bailon married in November 2017 after meeting the previous year at a whale watching festival in Puerto Lopez. West graduate Amber Cypcar and her husband Luis Bailon gathered with his family in the courthouse on their wedding day. From left: Sheyla Gomez (maid of honor), Graciela Castillo (Bailon’s mother), Cypcar, Bailon, Miguel Muñoz (best man), Pascual Bailon (Bailon’s father). Photo courtesy of Cypcar. 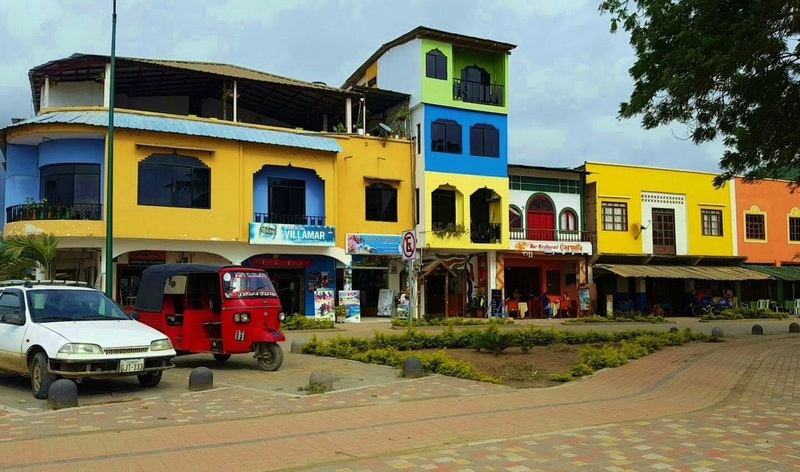 When making additional comparisons between the United States and Ecuador, Cypcar expressed that there is a difference when it comes to the quality of life. Cypcar also noted the importance of traveling and the global understanding that one can acquire through those experiences. Cypcar, who has visited a number of foreign countries, thinks that through international travel, people can gain a better perspective.